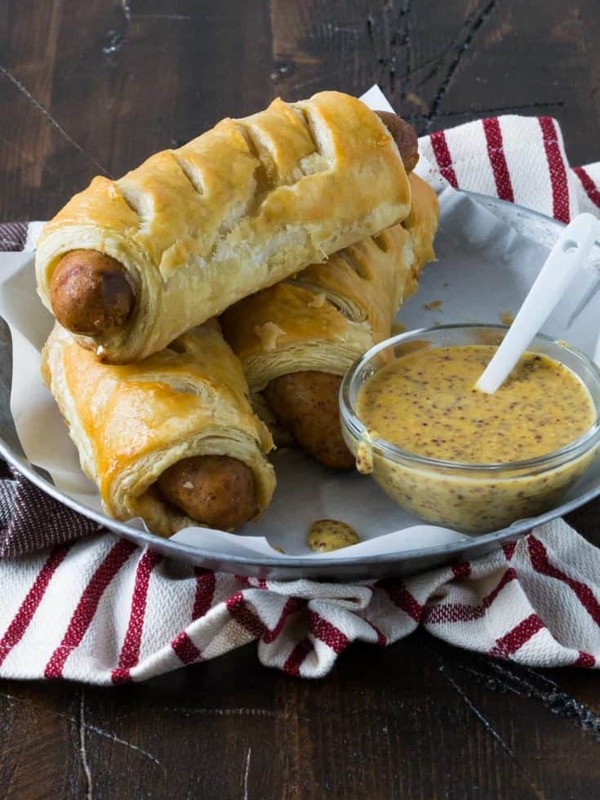 These Easy Sausage Rolls with Beer Mustard Sauce are the perfect fare for any occasion from game day to holiday gatherings. Hosting a crowd, even a potluck, doesn’t have to be stressful. 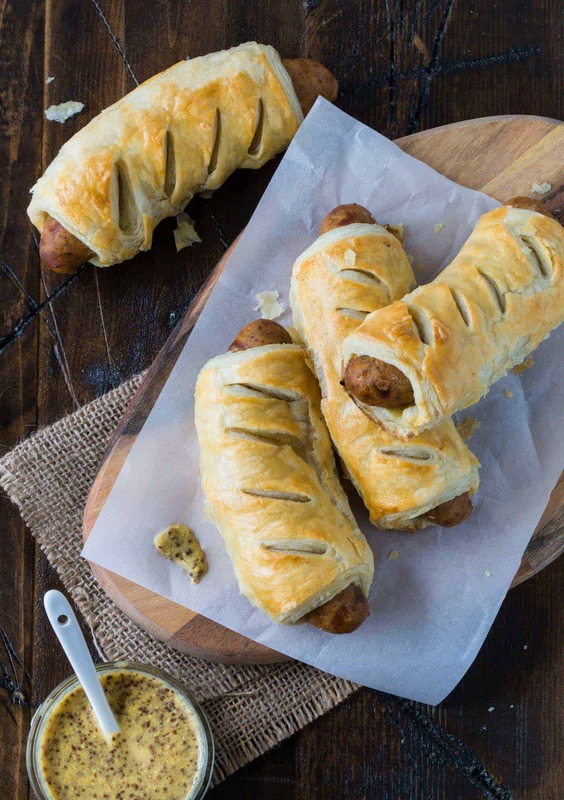 In fact, these Easy Sausage Rolls with Beer Mustard Sauce will make you look like you spent all day in the kitchen when they couldn’t be simpler to pull together, even at the last minute. 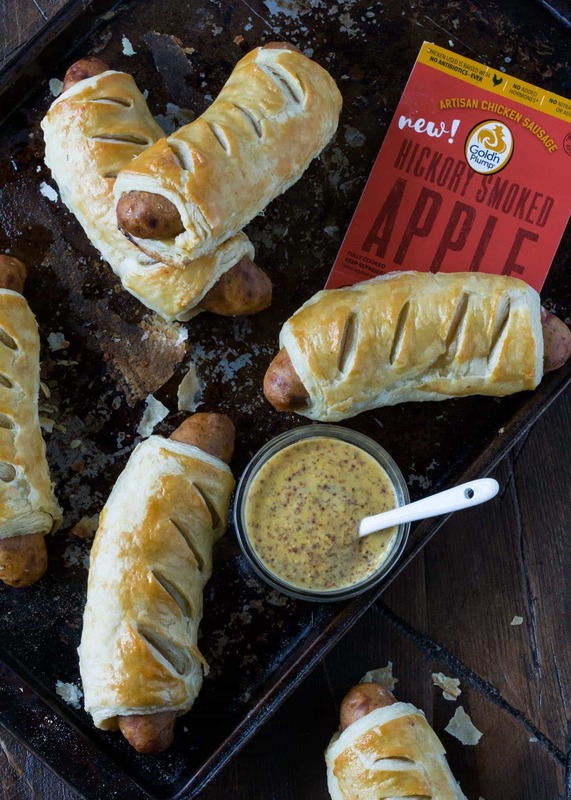 Taking these Easy Sausage Rolls with Beer Mustard Sauce from start to finish requires little more than a couple packages of Hickory Smoked Apple Artisan Chicken Sausages from Gold’n Plump®. These fully cooked sausages are made with chicken raised with NO Antibiotics–Ever and none of the fillers, preservatives or artificial flavors of other sausages. Wrap the sausages in defrosted puff pastry dough and pop them in the oven. While the sausage rolls are baking, whip up a bowl of the 5-ingredient beer mustard sauce. The tangy sauce is the perfect complement to the sweet and smoky sausages. Tip: Seal the edges of your puff pastry tightly and make sure the seam side is facing down on the baking sheet to prevent the pastry “shell” from coming apart during baking. Once you get the hang of these Easy Sausage Rolls with Beer Mustard Sauce, I know you’ll be itching for more. Lucky for all of us, Gold’n Plump has 4 other flavor varieties of their Artisan Chicken Sausages, so go on and experiment with other sausage and sauce combinations. I’m thinking the Italian Cheese + Peppers Chicken Sausage would make a tasty duo with a hearty marinara sauce. Is anyone free on Saturday night? Disclosure: This post was sponsored by Gold’n Plump. You can connect with them via social media including Facebook, Twitter and Pinterest. As always, all opinions are our own. Thanks for supporting the brands that make Garnish with Lemon possible. Unroll puff pastry sheets and cut each sheet into four equal squares. Brush one edge of each square with egg. Roll up sausages in pastry squares, taking special care to seal the edges together. Place the sausage rolls seam side down on a baking sheet. Cut small slits in pastry, if desired, and brush tops of rolls with remaining egg wash. Bake for 25-30 minutes or until nicely browned and pastry is cooked through. Serve immediately with beer mustard sauce. Whisk together all sauce ingredients in a small bowl.